Ninety-three million miles away, the sun blazes energy toward Earth. When this energy reaches Earth, the energy transmitted in short wave-lengths (visible light, ultraviolet, etc.) penetrates our atmosphere and strikes the Earth's surface. Energy in long wavelengths (such as infrared, thermal radiation or heat) is absorbed by carbon dioxide and other gases in the atmosphere. 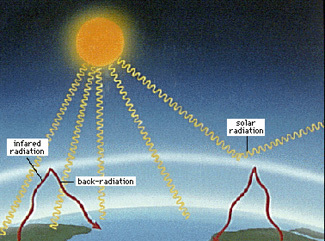 When penetrating short wavelengths strike Earth, they are converted into long wavelengths (in the form of heat radiation) and reflected back toward space. Some thermal radiation escapes, but most of it remains trapped inside our atmosphere. These long waves build up and keep Earth warm. This phenomenon, known as the greenhouse effect, enables life to flourish on Earth. Its future effects are also the subject of much discussion.As carbon dioxide and certain other gases increase in the atmosphere, more and more of the heat that should escape and radiate into space remains trapped. This trapped heat is the subject of debate within the scientific community. Scientists, lined up on each side of the issue disagree as to whether this heat may cause a rise in global temperatures. According to the late Carl Sagan, a world-renowned environmental author, the typical global temperature difference between an ice age and an interglacial period is three to six degrees Celsius (5 degrees to 11 degree Fahrenheit). Sagan theorized that if global temperatures were to rise three to six degrees C, water would become warmer and expand, melt polar ice caps and raise sea levels. Under these conditions, many islands would disappear and the oceans would flood such coastal cities as New York, Los Angles and Tokyo. Just a three-foot rise in sea level would triple the size of San Francisco Bay. Global warming may change precipitation patterns as well. Rainfall could decrease in some areas, causing water shortages and failing crops, while increasing in other areas with attendant flooding and soil erosion. Plants and animals that do not adapt quickly to the changing environment could become endangered species. Some scientists, however, believe that an increase in global temperature could result in increased crop yields. Higher carbon dioxide levels associated with global warming could be beneficial for plants. If carbon dioxide levels doubled, it is theorized that plants could improve productivity by as much as one-third. Some evidence shows that a rise in carbon dioxide could increase a plant's optimal temperature and allow plants to thrive in warmer temperatures. Those that subscribe to the greenhouse theory and global warming believe the primary cause of global warming is high emissions of carbon dioxide from industrial processes and the burning of fossil fuels. The U.S. is the world's largest carbon dioxide emitter. The greatest amount of carbon dioxide emitted comes from burning oil, coal and natural gas to produce the electricity that maintains the American standard of living. Transportation is the second largest contributor to the problem. Each car in the United State emits more carbon dioxide per year than the weight of the car. Some models used by scientists support the theory that an increase in atmospheric carbon dioxide produces global warming. Scientists have been making attempts to measure any difference in global temperature. Researchers at NASA as well as other scientists believe there has been a 0.5 degree C (0.9 degree F) increase in the average global temperature over the last 100 years. Other scientists remain unconvinced. Researchers using the TIROS-N weather satellite to measure the temperature of the lower portions of the atmosphere during the 1980s did not find any detectable warming. Despite the controversy over whether the global temperature is rising, the greenhouse effect is a well-established theory in atmospheric science. For example, Venus has a dense carbon dioxide atmosphere that could account for its surface temperatures of 426 degrees C (800 degrees F). Mars, with a thin carbon dioxide atmosphere, has an average temperature of -53 degrees C (-63 degrees F). This temperature difference, however, may also be partially explained by the distance of these planets from the sun.